Everybody needs some extra money to help towards paying bills or other miscellaneous expenses. 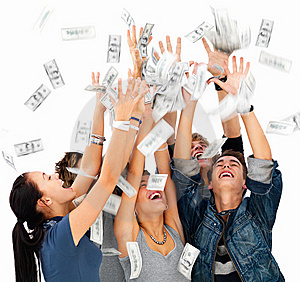 Likewise, teenagers are constantly hoping to make some extra bucks to line their pockets for their various needs. Parents may give allowance but that may not be enough and it is always good to encourage teens to make money through their own sweat. This is a good way of teaching them to buy their own phones, cloths and gadgets by making extra money. If you are a teenager, needing to augment your pocket money, you can do online jobs that pay pretty well. Young teenagers have plenty of hobbies and can create something they like, such as gadgets, games, MySpace and friendster by using Goggle Adsense. Start blogging your favorite creations and try to get in as much traffic as possible. This may require a lot of hard work initially but once you are aware of the system, then you can work through like a breeze. Your relevant keywords will be picked up by Goggle Adsense and will display the corresponding ads. As long as you have put up a good blog, there will be targeted traffic throughout and you can earn handsome commission for each click on your ads. For teenagers who like to write can try their hands at writing article directories for eHow and Associated Content, which are paid according to the number of times these were viewed by others. This may be appear slow but if you can do the job well then these sites are the ones you can choose. You will be doing what you like best and will earn enough to pick up your gadgets. Since teens have a lot of experience in social networking sites which can play a big role in helping to promote products. They can promote other people's products through affiliate marketing which is basically working for some companies who want to popularize their products. A certain amount of commission will be paid by sites like ClickBank for every product sold through your link. You do not even need to have your own products to make money as you will get paid for selling other people's products. Since teens are so good at surfing and getting any information from the web, this job is right up their alley. You will be required to complete certain tasks which cannot be completed by the computer. This site was created by Amazon and all you have to do is write short essays and find necessary information about various businesses. If you are a teen with an already popular blog then you can advertise for others on your blog. Advertisers are always on the lookout to popularize them and make their presence felt. Getting another popular website to advertise their own blogs and websites are all plus points for their ads. You will get paid a higher amount on a monthly basis if your blog is very established and popular. There are many other ways that teens can earn online and as long as they are good at what they do, the earning rates will get enhanced as time goes by. They can still do other things while they earn some much needed income online. Brianne is a blogger by profession. She loves writing on Technology and luxury. Beside this she is fond of gadgets.